On imperialism itself, [Mikhail] Bakunin [1814-1876] has nothing specifically to say. That is not strange, because imperialism in its modern form had not yet appeared; besides, opposition to imperialism by a revolutionary is a rather obvious thing. But I think Bakunin’s writings can be useful to anti-imperialists in several ways. Firstly, on account of the general view held by Bakunin about the essence of the revolutionary struggle and his conceptions about federalism and the state. Secondly on account of his activities in the eighty forties. As far as the last point is concerned, it is clear that I don’t wish to stress it too much. All historical parallels can be abusive. However, it is not abusive to point out the similarities between various kinds of Nineteenth Century nationalism and anti-imperialism in our time. This is not only because a great deal of today’s anti-imperialist fight is carried out on nationalist platforms, but also on account of the intensity with which the banner of then and that of today monopolise the attention of men with radical consciousness. In this respect, Bakunin has important things to say…. NOTES: Marked up by Leroy Maisiri, ZACF. Headings and explanatory notes added. 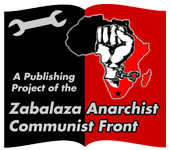 Author biography and Bakunin biography added by Lucien van der Walt. SOURCE: Workers Solidarity Alliance (New York USA) pamphlet (undated). Much of our time as revolutionaries is spent on the routine of organising in the here and now – building a campaign, organising for a demonstration, planning for a trade union meeting…. Too often we don’t manage to take time to step back from the here and now and imagine or envisage what it’s all about. But without dreaming, without imagining a future the daily humdrum can seem dispiriting. To really build for a new society, we need to try to paint a picture of what that society might look like. And we need to be able to suspend reality and dream of the sort of future that might be out there. This article is the first of what we hope will be a series which will attempt to look into a post-revolutionary future and imagine what such a society might look like. I’ve been blissfully ignorant of these ideas of privilege and the concept of checking it until very recently. It came across my radar after the fall out of a twitter row. A set of ideas were put forward, and argument was made. The response to this argument boiled down to the person was writing it from a perspective of “white male privilege”. The issues were side stepped. I assumed that this was an abuse of a theory that I didn’t understand, that privilege theory wasn’t simply a handy tool to dismiss an argument because you don’t like the person making it. I asked on twitter for some links so I could find out what this theory was really about. The most interesting and by interesting I mean the most infuriating was A Class Struggle Anarchist Analysis of Privilege Theory – from the Women’s Caucus.